*** Gala Nights are on the last dates for each category except for Stand-Up Comedy & Song and Junior Dance. RM 129 for 3 tickets (2 tickets for either week 1 or week 2 or week 3 + 1 ticket for Gala Night). Celebrating 10 years with 10 weeks of 10-minute theatre! With festivals in 14 countries, there is no stopping the SHORT+SWEET mania. Malaysia is no exception as the festival continues to grow here. We kick off in KL on 6 September with S+S Stand-Up Comedy+Song followed by Musical, Junior Dance (new category for dancers 16 and below), Dance and finish off with a record-breaking three weeks of Theatre ending on 29 October. It then moves on to Penang from 1 to 11 November for Dance and Theatre. What makes the festival so popular is its unique format. It only premieres new works that are 10 minutes or less. Not only will you be the first to watch these new creations but, in a single night, you get to watch 10 to 12 different works. SHORT+SWEET also runs as a competition. The performers compete for a place in the Gala Finals where the winners will win prizes including the coveted Mercedes-Benz Award for Creative Excellence. Root for your favourite team or, better yet, vote for them and they stand a chance to win the Audience Choice Award. Come, celebrate us and get swept up in this SHORT+SWEET mania. Like a good Malaysian buffet, there is something for everyone. 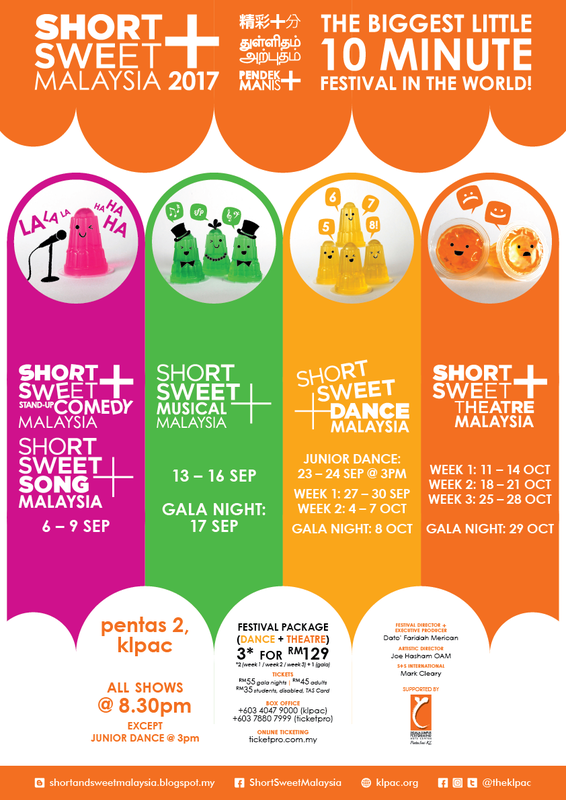 Short + Sweet Malaysia is also sponsored by The Actors Studio Seni Teater Rakyat. CALL 03 4047 9000 TO PURCHASE TICKETS OR TO GET MORE INFO!